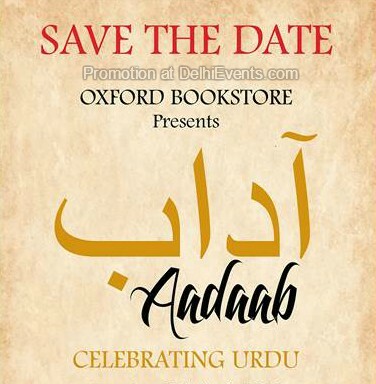 Event Description : LITERARY FEST "Oxford Bookstore Aadaab-Celebrating Urdu" Conceptualized by Oxford Bookstore, New Delhi, “Oxford Bookstore Aadaab: Celebrating Urdu” will be a day-long festival of celebrating Urdu language. This literary event will focused on Urdu literature, poetry, especially the verse forms of the ghazal and nazm & various researches held on the language. The occasion has been conceptualized as a tester's menu, a sampler, a buffet of the many flavors contained in Urdu language, literature and writings, voices, subjects, tones and themes. The idea is to give audiences a taste of the many delights contained within the literary culture of Urdu. A day-long celebration of Urdu language is followed by different sessions like HUM KALAAM, TAZKERA E TARJUMA, ZUBAAN E DELHI, NUKTA E NAZAR, BAZM E KHAYAL, BEGUMAAT KI BAATEIN, KUCHH QISSE KUCHH NAZME-KAIFI AZMI The sessions will have some notable personalities like Rana Safvi, Dr. Urshila Chanana, Aqib Sabir, Manu Sikander Dhingra, Rene Singh, Azhar Nawaz, Asiya Zahoor and many more.This event will serve as a platform for the people who are looking forward to explore this language through various discussions and intellectual sessions with the experts of urdu language. Oxford Bookstore is not only about books of various genres, but recently it has also emerged as a hub of many cultural events, in-depth discussions & interactive interesting talk sessions which are held with famous personalities of the society. The evening promises fun and joy with urdu language and poetry on 28th April 2018 at 2:00 pm onwards About the Panelists Manu Sikander Dhingra Manu Sikander Dhingra started his ishq with art as a theatre actor since 2003. He has acted in plays directed by Barry John, Habib Tanvir, Avijit Dutt, Rajinder Nath, Sanjeev Johri, N. Kumar and Rajeev Ashish. Manu has been performing Dastangoi with Mahmood Farooqui and team since 2009.He runs the theatre production house “The Hoshruba Repertory” with actor, director and fellow dasantgo/Qissebaaz Danish Husain. Manu Sikander is owner of a popular dry fruit brand called Kabliwala's, he has beautifully managed his passion of making people healthy and happy. Rene Singh Rene Singh is a trained singer in semi-classical music. She has a vast knowledge of Sufi and Urdu poetry, which has led her to delve into its history and musically present the lives of various poets to the people across the globe. She curates and designs modules and workshops through poetry and music. She has partnered with UNICEF to create musical stories for community radio in the remote villages of the country and has earned great appreciation for her work in Kashmir with orphan girls affected by terrorism. She is the founding member of HUM: Hamari Urdu Mohabbat, which has become a leading group for performing this form of poetry and singing. Aqib Sabir Aqib Sabir, twenty-two, is an engineering graduate and hails from a small industrial town, Richha, in Uttar Pradesh. He rejected an engineering job offer because he believes his life is meant for understanding and creating art which he says he realized only after graduating. He also hopes to become a professor and teach English literature. Born to a father who is also an Urdu poet, he himself writes Urdu poetry. Some of his poetry has been published in an anthology called Wordwine. He currently lives in Noida. Asiya Zahoor Asiya Zahoor teaches Literature at Baramulla College, Kashmir. Asiya is a poet, a linguist, a filmmaker and an academic. Asiya has studied Psycholinguistics at Oxford University and Caribbean diasporic literature at the University of Kashmir. She is a visiting scholar at the University of Westminster for a research investigating the representation of Kashmir in literature and cinema. She has authored books, made films and written articles and poems on issues like politics of place, diaspora, the literature of exile, the Muslim identity and psychology of language learning. Asiya has curated a website www.bolbosh.net to help documents languages and literature of Kashmir. Azhar Nawaz Azhar Nawaz, creates beautiful linguistic castles with those languages, particularly Urdu. He did graduation and post graduation in English Literature from Jamia Millia Islamia. He writes poetry in Urdu and has been regularly participating in poetry recitation programmes and other literary activities. His Ghazals have been published in leading journals and websites like Milli Ittehad, Rekhta.org and Kaafiyana. Rana Safvi Rana Safvi is a historian, author and blogger documenting India's syncretic culture via its history, monuments, cultural traditions and food.The historian who is passionate about preserving the ‘Ganga-Jamuni Tehzeeb’ of India. She has taken many into her fold. She is also the founder and moderator of the popular platform #shair on Twitter which is aimed at reviving popular interest in Urdu poetry. Her blog ‘Hazrat-e-Dilli’ aims at enriching younger generation about how incredible India is. Dr.Urshilla Chanana Dr Urshilla Chanana did her masters in english literature and later phd in psychodynamics of human relationship from delhi university. She loved teaching and was very popular with her students because of her intense and passionate engagement with english literature the way she felt and communicated. Her life long relationship with english literature went hand in hand with another cherished interest - urdu poetry. As an idealistic deeply introspective and thoughtful person urbane and widely travelled is yet socially rooted. contemporary issues with multiple perceptions and variation of facets are analysed by her in talks and are also brought out in the pages of her book'nazariyae' published in 2011.